My paper “The periambic constellation” was over 40 years in the making. Here are some highlights, surviving ephemera, and continuing fallout from this long project. 1974: This grayscale scan shows a portion of the large sheet of paper on which I first recorded my construction of the central parallelogram (using common chords of intersecting circles, not radical axes). The “extral points” z_1 and z_2 on the drawing are now called P and Q, two of the four “major periambic points.” The conjecture that the line joining z_1 and z_2 passes through the triangle’s incenter turned out to be false. 1991: The Monthly wasn’t interested. 2003: Early in 2003 I began using The Geometer’s Sketchpad, with which I discovered the inverse similarity of a triangle and its minor periambic triangles (I’ll call this the “Inverse Similarity Theorem,” or IST, here). Here’s a PDF of an unfinished draft paper whose creation date is 30 June 2003. I began the draft in an informal style that I hoped would be appropriate for a general interest journal. I also showed the IST to my friend and longtime math collaborator, Marty Getz (see 2007 below). 2004: I spent a fair amount of time trying to find an elementary, synthetic proof of the Inverse Similarity Theorem; indeed, I got frustrated enough that I didn’t care who proved it, so long as a proof could be found. To that end, I posted this problem statement on my website. I have no evidence that anyone ever saw or downloaded this PDF. 2007: Here’s a PDF draft of the unfinished periambic paper, dated 5 August 2007. Theorem 6 in this draft mentions an intricate result discovered in March 2003 by my friend Marty Getz. 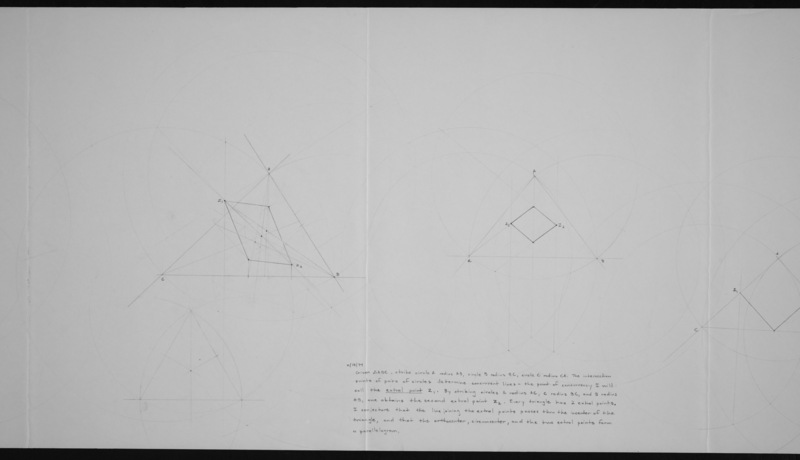 I had shown Marty the IST soon after I’d found it, and in playing with the constellation he found some tricky triples of collinear points, shown here in his original Geometer’s Sketchpad drawing. Three elements indicated by wiggly lines are in Marty’s hand, the other labels are my attempts to reconcile my notation with his (and my notation changed many times since then). 2008: Still unable to prove the IST, I sent my 2004 PDF to the Monthly as a problem proposal without a solution. They received the submission, but they didn’t want it. 2014: I removed all references to the periambic constellation from my site in May, assuming that the IST proof was beyond my ability and that the project was dead. 2016: In the fall of 2015, I began to warm to the idea of an inelegant, computational proof of the IST. I tried trilinear coordinates, then polar coordinates, and on 9 February 2016, I managed to complete an awkward Mathematica notebook that verified the Inverse Similarity Theorem by brute force: It “proved” a horrid-looking trig identity by generating a multi-page trigonometric function that Mathematica could miraculously show was identically equal to zero. Enormously elated, but still daunted about how such a monster would be explained in a paper, almost immediately I shared the problem and my “victory” with my friend Walt Tape, a retired (but still active) mathematician who was also a professor of mine in the 1980s (and who I almost never bother with my hobby-level work). Within four hours, Walt had sent me a direct Mathematica verification of the proportionality aspect of the IST. A week or so later, he gave a somewhat simpler trigonometric proof of the proportionality (but still, some steps in this proof conceal formidable trig calculations). Walt’s proofs broke through the impenetrable wall I had constructed in my mind around the problem, and which my own “proof” had done little to diminish. The completed paper “The periambic constellation” was submitted to Forum Geometricorum on 9 October 2016, its receipt was acknowledged four days later, on 13 October 2016, and the paper was published online on 28 November 2017. 2017: Just before sending off “The periambic constellation” for publication in October 2016, I continued to seek, and failed to find, a simpler proof of the IST; but other results turned up. On 15 October 2016 I began a second paper, and submitted it on 19 December 2017 to a general interest journal. 2018: I more or less proved “Getz’s Conjecture” (see 2003 and 2007 above) around the beginning of May 2018, but it took a while after that to get the details right. It turns out that triangle ABC must meet some simple and attractive conditions for the required intersections to exist. A paper on this result is available as a preprint. Updated 9 September 2018, 26 December 2018, 3 January 2019.